The first woman to lead both legislative chambers aims to be the first female governor. AUGUSTA – It may seem hard to believe, but at one time Libby Mitchell was an outsider trying to break into Maine politics. Just three years after moving to Maine to raise a family, Mitchell decided to run for the House of Representatives. It was 1974. She was so new to the area that Democratic Party elders found another Democrat to challenge her in the primary. The South Carolina native won anyway, then won the seat to represent what had been a traditionally Republican district, in Vassalboro. Since then, it’s been a series of firsts for Mitchell: first female speaker of the House, in 1997; first woman appointed chairman of the board of the Federal Home Loan Bank of Boston; and, after being chosen Senate president, the first woman in the country to have led both state legislative chambers. So to Mitchell, a bid to be Maine’s first female governor is simply the next step in a groundbreaking political career that has spanned 18 years in the House and six in the Senate. Mitchell, 69, entered the race for governor in August, putting her political future on an uncertain path in a year when many are vying for the chance to succeed Democratic Gov. John Baldacci. In the June 8 primary, Mitchell faces three opponents: former Attorney General Steve Rowe, who succeeded Mitchell as speaker; former legislator and Conservation Commissioner Patrick McGowan; and Rosa Scarcelli, who runs a housing company. That same day, Republicans will go to the polls to choose from seven candidates. The winners of the primaries will face at least two independent candidates in November. 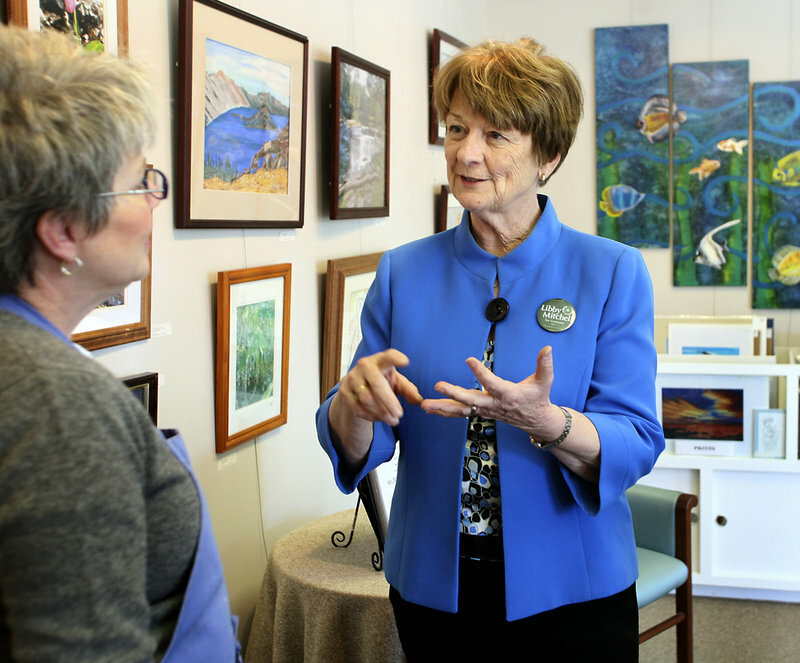 Mitchell said her experience as a teacher, legislator, Senate president and head of the Maine State Housing Authority make her the best choice to lead her party, and the state. In the housing authority, she worked with many companies to help people get the housing they needed. That job led to an appointment as co-chair of a national task force that created a low-income housing tax credit. Mitchell grew up in Gaffney, S.C., and worked in a peach-packing business when she was a teenager. Her father was a salesman and owned a neighborhood grocery store. Her mother taught in a one-room school and later worked at the store with her father. Mitchell, who has one sister, also helped out at the store, stocking shelves and working the cash register. Her political heritage is well known in Gaffney. Her grandfather was a state lawmaker and sheriff, and her father served on the county election commission, according to the Spartanburg (S.C.) Herald-Journal. After high school — she was Gaffney High School senior class president in 1958 — Mitchell earned bachelor’s and master’s degrees in education, and went on to teach at Camp Lejeune in North Carolina and in Switzerland, where she worked in an international girls’ school. She and husband, Jim, moved to Maine in 1971 for his work. Once settled, she taught English as a second language and adult education. Her background as a teacher and her interest in education carried over to her legislative career, as she worked to expand the federal Head Start program with the use of state funds. She also pushed to get the state to pay for a 13th year of education — an effort that failed but led to more scholarship money for students, she said. More recently, she has worked on the controversial school district consolidation plan, and has seen the results from both sides: as a Vassalboro selectman for nine years and as a state legislator. In addition to concerns about changes to the quality of education, Mitchell said consolidation has had a fiscal impact in her town. If she had been governor, Mitchell said, she would have pushed for consolidation to save money on administration, but would have gone about it differently. She would have promised state money to pay for a certain number of administrators and, beyond that, districts would have had to ask taxpayers for extra money if they wanted additional management. “I will not back away from the need to reduce the size of administration, because we’ve lost a number of students,” she said. While on the stump, Mitchell spends a fair amount of time talking about jobs and the economy, and the state’s shift from large manufacturers to smaller entrepreneurs who will create the jobs of the future. Part of that future — either in the private sector or in government — is likely to include Mitchell’s adult children, all of whom have returned to Maine after leaving for a time. Two of her four children have already served in the Legislature, and another is running for Vassalboro’s House seat this year. During the campaign, she has emphasized her ability to work with Republicans. She often talks about the two bipartisan budgets and two bipartisan bond packages that were passed during her tenure as Senate president. Her husband is a Kennebec County probate judge. He ran for Congress once. After that, his wife says, he put his political dreams aside so she could pursue hers. “He was just as supportive of me as he was of his own ambitions to be in office, which is pretty remarkable,” she said. When she’s not focused on politics, Mitchell has three places in Maine where she loves to take pictures: the state Capitol, the Pemaquid lighthouse and Moosehead Lake, where her family has a camp. “All of these places are food for the soul,” she said. While in her 60s, Mitchell returned to school to earn her law degree. She practiced with her husband’s firm, Mitchell & Davis. Once she was elected Senate president, she no longer had time to practice law. She once tried a probate case in Machias, but she doesn’t claim to have a lot of law experience. As a gubernatorial candidate, she talks about the need for 40,000 Mainers to go back to school to get the education they need to drive a successful economy moving forward. It’s her priority to make education more accessible for high school graduates and adults who need additional training.